Moorestown (December, 20 2016)—For many years, Moorestown Business Association (MBA) has committed to help preserve and enhance the community through designated gifts to specific projects and organizations that make Moorestown exceptional. Most recently, the MBA board voted to support the renovation of Perkins Center of the Arts’ historic Carriage House. MBA President Don Powell and Vice President Steven Pazienza presented the $5,000 gift to Perkins Executive Director Karen Chigounis and Associate Director Diane Felcyn at a recent presentation event. Perkins Center for the Arts is a unique resource in the midst of Moorestown that strengthens and enriches the community through arts education and opportunities, serving as a fine arts and music school, art gallery, concert venue, pottery and dance studios, arts camp and more. The mission-driven work of this vibrant arts center would not be possible without the adaptive use of its base of operations, the historic Perkins Estate, which includes the main house (“Evergreen Lawn”), the Carriage House, and an Arboretum. An estimated 800 people walk through the center’s doors each week during 50 weeks of classes and music lessons annually. Though owned by the township, the maintenance and preservation of Perkins’ buildings and grounds are the responsibility of the non-profit arts center headquartered there. Public support is critical to helping ensure the estate is used to the best of its capacity to continue its valuable contribution to the community. “The MBA board is happy to support this invigorating cultural asset that draws people from all over the region, which in turn boosts commerce and Moorestown’s reputation as a vibrant town that has much to offer its visitors and residents,” noted Don Powell. 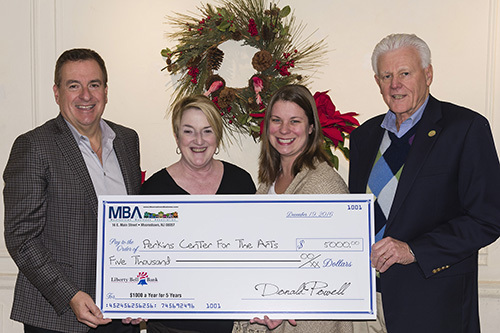 The MBA gift is earmarked to assist Perkins Center for the Arts continue its adaptive reuse of the historic Carriage House. Originally constructed in 1930, the Carriage House first floor was reconfigured as a dance and painting studio after Perkins Center was established in 1977, and went on to house other arts programming and to become the hub for Perkins Center’s summer camp. After 39 years of constant use, significant renovations are due, but the annual operating budget does not generate enough revenue to cover the expense. Through improved facility conditions paid for by the MBA gift and others like it, the Center can continue to provide the community access to a piece of Moorestown’s past while also attracting new audiences to Moorestown, who in turn will contribute to the local economy and businesses. Photo: (L. to R.) Steven Pazienza, MBA President-Elect, Karen Chigounas, Executive Director, Perkins Center for the Arts; Diane Felcyn, Associate Director, Perkins Center for the Arts; Don Powell, MBA President.